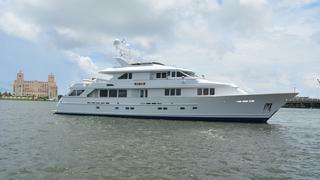 AR­DE represents a very well equipped custom Burger Tri­Deck Motor Yacht. 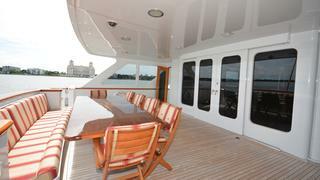 Starting on the main deck is a large aft deck area with teak table and abundant seating, ideal for outdoor entertaining. 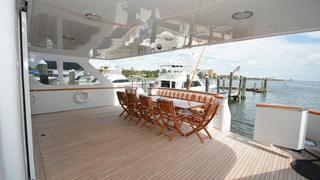 From the aft deck, enter the main salon through automatic sliding doors. 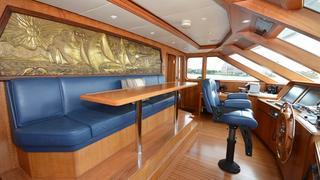 The elegance and quality of finish and detail is evident of a custom Dee Robinson interior. 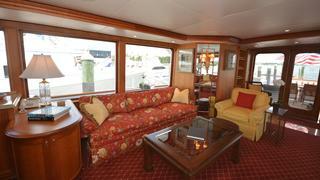 The aft salon area is furnished for relaxing and entertaining. 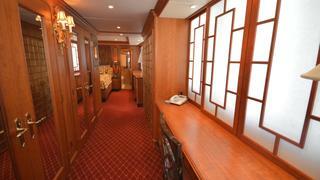 Forward in the main salon is the formal dining area. 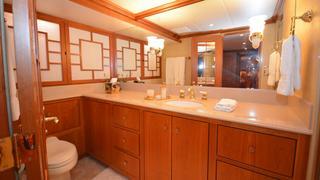 Continuing forward of the main salon to starboard is an on­deck powder room and the entrance to the master stateroom. 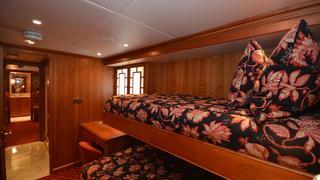 The master stateroom is full beam width with private his and her heads forward. Three sets of large windows provide a very open and light feeling in this area. 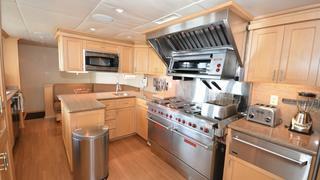 A commercially equipped galley is accessed through a door on the forward port side of the main salon where you will find all the equipment necessary to satisfy any professional chef. 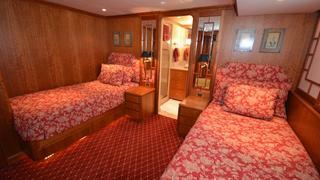 A settee and table in the galley provide an area for crew meals and forward in the galley are stairs up to the pilothouse and down to the crew quarters. 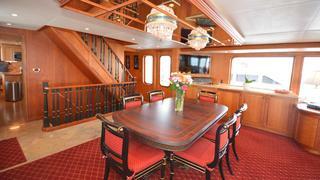 Forward of the main salon are stairs down to the lower accommodation area and four guest staterooms. 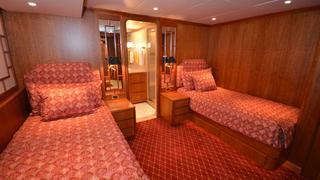 Three of the staterooms have two twin berths with the fourth stateroom having twin bunks. 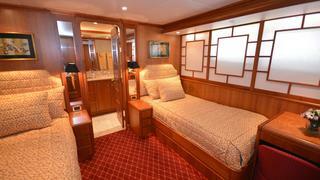 Each stateroom has an en­suite head and includes a high level of interior finish. 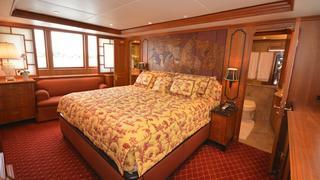 Forward on the lower deck is the crew area with four separate staterooms each with an en­suite head. 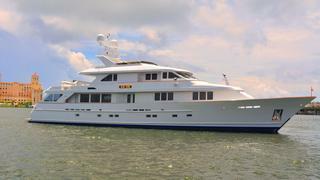 Aft on the lower deck is the engine room and lazzerette where the finest in yacht equipment and features are maintained in spotless condition. 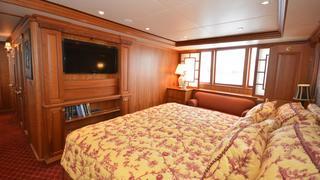 The upper deck is accessed via a stairs in the main salon where forward is the pilothouse equipped with dual radars as well as the navtronics necessary for worldwide cruising. 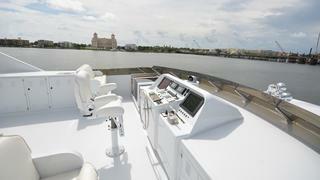 Two wing control stations are located on the outside deck to port and starboard. 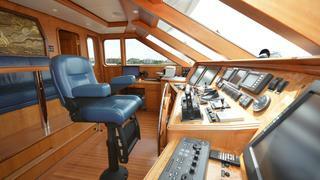 Aft of the pilothouse is the private owners office/study with built­in wall unit, sliding privacy doors and windows to provide natural light. 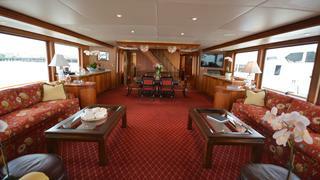 The skylounge, located just aft of the office, features a full service bar, a large seating area, entertainment systems, 52" plasma television and powder room to port. 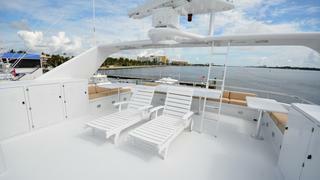 This is an ideal area for entertaining or relaxing to watch a movie or football game. Exiting the skylounge aft is the upper aft deck where two 4000lb davits provide easy off­loading of the tender to either side of the vessel. 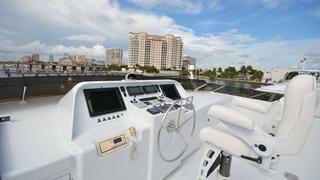 The flybridge deck is access via an inside stairwell behind the pilothouse where you will find a full helm control station a walk­up bar and seating and tables for outdoor lounging and entertaining. 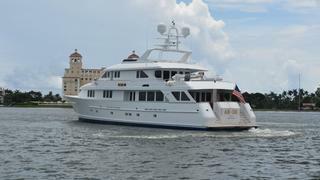 AR­DE is a must see vessel when looking for an efficient Tri­Deck Motor with a custom designed interior along with new complete paint job in 2009/10.